Seven-passenger luxury hybrid crossover delivers 26 mpg! Since its launch in early 2012 as the Infiniti JX35, the renamed Infiniti QX60 has become one of the hottest-selling vehicles in the growing luxury crossover segment. Second to only the current Infiniti G line in sales, the QX60 has been extremely popular with families looking for a seven-passenger, three-row crossover that blends attractive exterior styling with a technologically advanced luxury interior. Available this summer, the all-new 2014 Infiniti QX60 Hybrid is expected to return an impressive 26 mpg combined city/highway – an improvement of 24 percent over non-hybrid QX60 models. 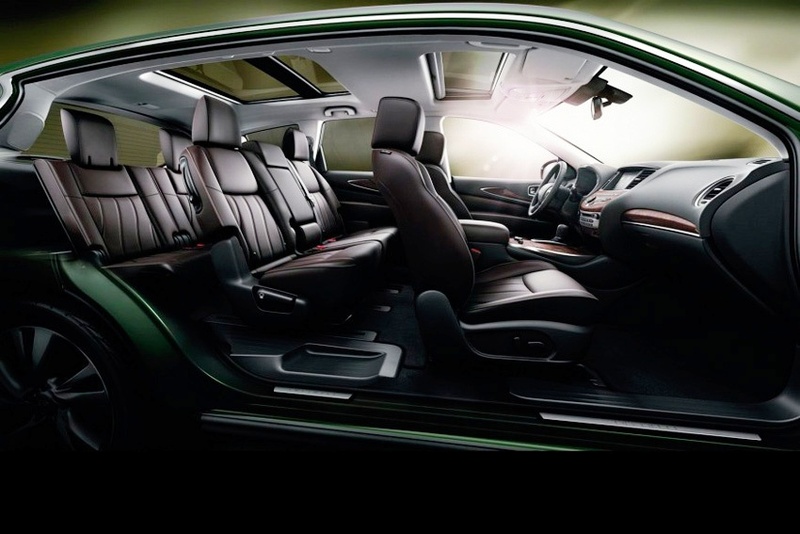 Unlike competitive hybrid crossovers that compromise performance, interior roominess and cargo space compared to their non-hybrid counterparts, the QX60 Hybrid is as roomy and quick as the non-hybrid QX60. The QX60 Hybrid achieves its remarkable performance through the Infiniti Direct Response Hybrid System, using a compact Lithium-Ion battery along with a 2.5-liter supercharged four-cylinder engine, 15-kilowatt electric motor and an advanced Continuously Variable Transmission (CVT). The system delivers 250-hp, power equivalent to the 3.5-liter V6, while returning four-cylinder fuel economy. The QX60 Hybrid can also be equipped with front-wheel-drive or, for superior traction in all weather conditions, all-wheel drive. The QX60 Hybrid features Infiniti Drive Mode Selector, a traction control system with “Standard,” “Sport,” “Eco” and “Snow” settings, to optimize traction depending on conditions. The Lithium-Ion battery pack is located under the third-row seat. Thanks to its compact construction, the cargo-area floor is as flat as that of its non-hybrid counterpart for easy loading. For families with little ones and big cargo requirements, the remarkably versatile QX60 boasts segment-leading overall passenger volume, segment-leading rear cargo volume and access to the third row without having to remove the second row child seat. Second-row seats can be adjusted 5.5-inches fore and aft for maximum flexibility. A standard power rear liftgate helps make loading cargo even more effortless. Third-row seating is comfortable, even for adults, with ample headroom and knee room, while access to the third row is excellent thanks to wide door openings and the nearly six inches of forward slide capability of the second-row seats. 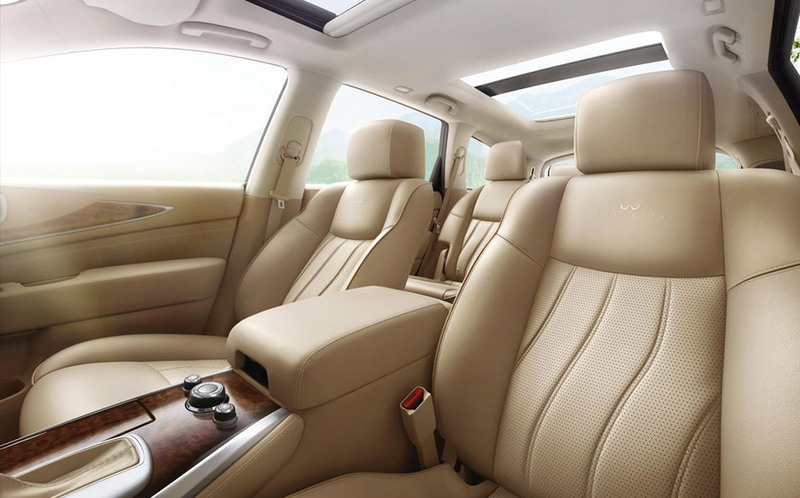 As practical and versatile as the QX60 Hybrid interior is, it’s equally luxurious. Chrome accents are found throughout the interior, as is gorgeous Wheat, Graphite, or Java-colored leather upholstery with Kasane Washi trim and available Maple trim accents. The driver-oriented cockpit, designed to evoke the natural, powerful and soothing flow of water, is anchored by the Intelligent-View display in the center cluster and highly visible Fine Vision electroluminescent gauges. Exclusive Hybrid Electric Vehicle (HEV) gauges are featured on the standard seven-inch color vehicle information display, showing the flow of energy between the engine, electric motor and battery pack. The QX60 Hybrid comes standard with a long list of luxury features including leather upholstery, heated and power-operated front seats, power-folding heated outside mirrors, power-sliding tinted moonroof, RearView Monitor, Bluetooth Hands-Free Phone, and a six-speaker stereo with SiriusXM Satellite Radio and iPod integration. Also standard and free of charge for four years is the Infiniti Personal Assistant, a 24/7 concierge service that provides your own assistant to make dinner reservations, get directions and find points of interest, all from the touch of a button. The Infiniti QX60 offers additional advanced safety technology. The available Driver Assist Package includes Backup Collision Intervention and Blind Spot Intervention systems to help the driver detect crossing vehicles; in an emergency, the vehicle can also automatically engage the brakes to avoid a collision. The Around View™ Monitor and Moving Object Detection systems show the driver a 360 degree image surrounding the vehicle for maximum visibility. Audible warnings alert the driver even when an object can’t be seen. Lane Departure Warning, Blind Spot Warning and advanced Intelligent Cruise Control with Distance Control Assist round out the long list of safety technologies available on the QX60 Hybrid. 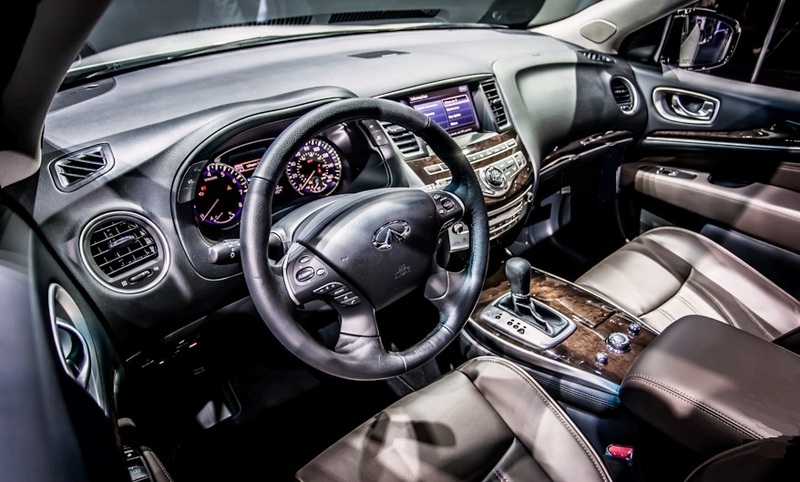 For families that value roominess, cargo capacity, versatility and advanced safety technology as much as they put a priority on being environmentally conscious, the 2014 Infiniti QX60 Hybrid is the ideal luxury crossover vehicle.